KuKu is a class of Persian frittata dishes, often served with bread and as dinner options. Similar to frittata dishes the idea behind Kuku is to mix whatever is in-hand with eggs and fry the resulting custard in a skillet until the egg mixture is set. Although it is a one-pot leftover-based dish, the most popular types of Kuku dishes can be itemized as potato, green bean, eggplant, zucchini, and perhaps the most famous, the mixed herbs (i.e. Kuku-Sabzi). As was demonstrated here, Kuku-Sabzi is made with mixing an assortment of finely chopped herbs with eggs. 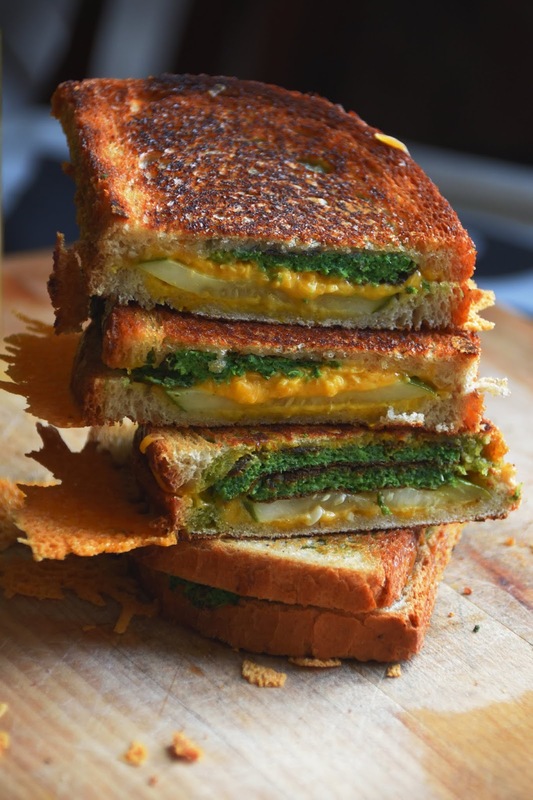 Here I give a modern twist to the Persian dish by making panini sandwiches with the leftover Kuku slabs. The inspiration behind the dish was the Cuban sandwich; therefore, mustard, cheese, and pickles are used for the preparation. Spread the mustard on bread slices. Arrange the Kuku-sabzi slabs on one of the bread slices and cover them with a layer of pickles and then sprinkle the cheese. Put a heavy pan on medium-high heat, making sure it is very hot. Add a few drops of oil and then arrange two sandwiches side-by-side. Put a heavy object (e.g. a cast iron skillet) on the sandwiches to press and decrease the heat to medium. 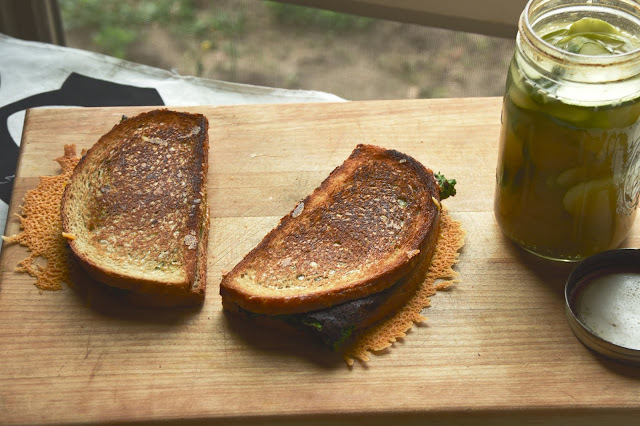 When one side of the sandwiches are golden brown (about 2 to 3 minutes) turn them over and repeat the process for the other side. 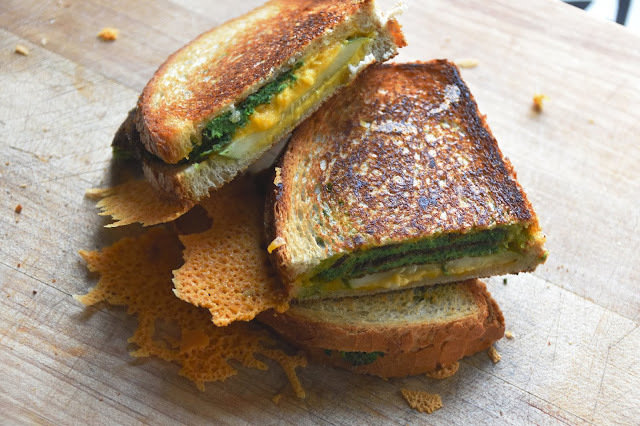 If you'd like the crispy cheese (as shown in the pictures) drizzle a ring of cheese (extra to the recipe) around the sandwiches in the last thirty seconds of grilling. Repeat the process for the other two sandwiches. 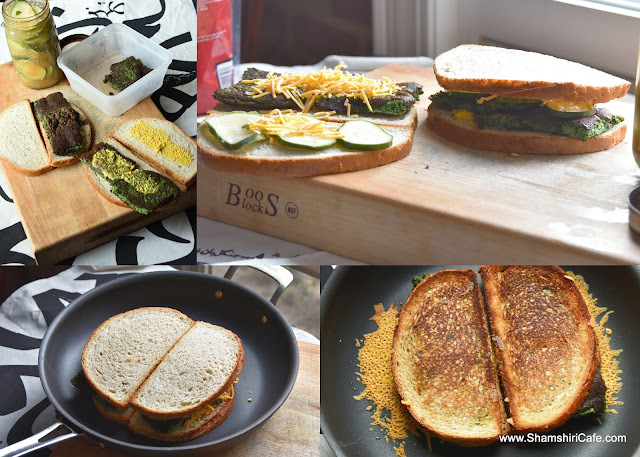 Cut the sandwiches in half and serve.